Lack of time to focus on diet, exercise, and physical activity has led to several people fall prey for nutritional disorders. At the same time, with the easy access to fast food products and junk food, children and youth have become less immune to microbes and infections. All these lifestyle issues call for nutritional products to help people meet their dietary requirements. 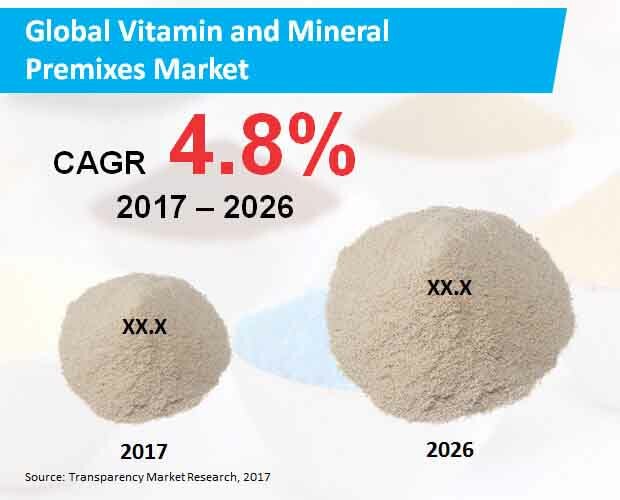 The global vitamins & mineral premixes market has been growing at a steady pace in the past few years, and is predicted to attain a higher CAGR in the forecast period. The global vitamin & mineral premixes market was valued at US$ 700mn by the end of 2017. Analysts state that the market could attain an overall value of US$ 1bn by the end of 2026. This is expected to happen due to a steady CAGR of 4.8% between 2018 and 2026. Several factors like increased health and fitness consciousness, impetus on healthcare in developed and developing nations, and rising literacy levels among people are fueling demand for vitamin & mineral premixes. Further, internet and social media also play a crucial role in creating awareness about vitamin & mineral premixes. The global vitamin & mineral premixes market is segmented based on ingredient, form, application, and function. Among these the application sector is expected to hold the highest share in the global vitamin & mineral premixes market. Sedentary lifestyle had led to several nutritional disorders among people, especially young population across the world. It has become a common trend to consume nutritional supplements either in the form of pills, syrup, or food items. The growing consciousness towards health is fueling demand in the vitamin & mineral premixes market. Many people due to immense work pressure and long working hours are unable to take care of their dietary requirements. This leads to fatigue and other lifestyle problems. Hence, many young professionals are starting to take nutritional supplements on the go. Food products which are rich in nutrition and can be consumed on the go are shooting up consumption in the vitamin & mineral premixes market. At the same time the growing fitness interest among young people across the globe is paving way for nutritional products. To achieve stringent fitness targets, sportspersons and fitness enthusiasts consume vitamin & mineral premixes. Geographically, the global vitamin & mineral premixes market is divided into North America, Asia Pacific, Europe, and Rest of the World. Among these, North America has held the highest share so far, and is predicted to maintain the status by the end of 2026. U.S. market alone is expected to stand at a total value of US$ 400mn by 2026. The high awareness levels among people about their health and the wide presence of pharmaceutical companies in the U.S. are key factors for growth in the vitamin & mineral premixes market. Transparency Market Research (TMR) provides valuable information on the global vitamin and mineral premixes market in recently generated report, and throws light on the major factors influencing growth of the global market. The report offers analysis for the period, 2017-2026, and in-depth insights pertaining to the growth patterns has been incorporated in this report. Also, crucial information related to the region-wise and segment-wise analysis has been provided in the report that can benefit the readers and clients. In-depth insights encapsulated in the overview of this report offers perspectives on the current market scenario and growth patterns of the global market. In this section, the report provides important information related to the trends, restraints, and drivers that will influence growth of various segments in the market. In addition to the major factors influencing the global market growth, the report offers in-depth insights related to the cost structure, distributors, pricing analysis, and supply chains. Also, the report offers important information related to qualitative analysis in the major drivers and recent trends influencing global market growth. On the basis of valuable insights provided in this section of the report, distributors, manufacturers, and suppliers can develop informed strategies. Trade magazines and leading journals can also utilize insights offered in the report to their benefit. Crucial information encapsulated in the competitive landscape section of the report offers detailed insights pertaining to the key players in the global market of vitamin and mineral premixes. This section of the report offers detailed insights related to the major strategies that the leading players are adopting, based on which the readers and clients can benefit and understand the influence of these strategies on the global market growth. On the basis of detailed insights offered in the report, clients and readers can formulated effective business strategies. In this section, the report provides perspectives and detailed insights derived through primary and secondary research techniques. Company press releases, interviews with the experts and influencers, industry databases, and investor briefings have been considered in the report before formulating predictions and conclusions. The report also provides quantitative analysis on the basis of extensive research techniques. In-depth insights encapsulated in the report allows the readers and clients to attain a deeper understanding of the growth patterns in global market and make better decisions. Valuable insights offered in the report can be utilized by the readers and clients in various industries to their benefit. Based on the detailed insights offered in this report, new entrants in the global market can understand the current market scenario better, whereas the established firms in the global market can formulate strategies in pace with the recent trends. All in all, detailed insights and perspectives offered in the report can offer imperative information to the readers, investors, key players, and clients for developing effective strategies and better decisions.